Sequenced keys skip in gust behind an effect of fog, bringing to our ears these soft melodious presages of Halloween. Every ringing frees an additional tone, making so that "Playing in the Garden" releases itself little by little from its demonic envelope to derive into Indra's very ethereal minimalist universe. Electronic effects flutter and dissolve in the harmonies of a false guitar, whereas the dance of sequences gets a little faster. The movement rises and comes down, fooling the ear with a subtle gear change in the flow. Sighs of synth are lying all along this effect of roller coaster, while Indra frees metallic bangings at the same time as the percussion sculpt a kind of tick-tock. And still, in the 10th minute, the Rumanian synthesist adds other sequences which quaver on this line of minimalist rhythm that we would want endless, so much the charms of "Playing in the Garden" bring us in a crack of time. The vintage years! Eighth chapter of the mega Archives series, “Emerald Three” pursues this assault of EM made in Rumania that Indra dusts of his vaults for the most great pleasure of his fans. And the more we move forward in the series and the more the pleasure becomes a voracity. After the delicious sighs which mewl in the Dalidesque Eden which is "A Long Time Ago", the synth is simply enthralling here, "Union (live)" brings us back to these structures of minimalist rhythms always delicately drummed of the Indra rhythmic world. A little more fluid than the dumbfounded cherubs' pace in the labyrinths of "Playing in the Garden", the rhythmic structure of the opening shapes a dance of lost steps in a narrow tunnel where the walls ooze from hoarse gusts. Angelic voices hunt these internal winds at the same time as they reduce the pace of "Union (live)" which crosses a first ambiospherical phase around the 5th minute. Effects of Elvish voices and breezes fed of ochred dusts float there. Some ringings pierce this mesmerizing layer of elegiac voices about 3 minutes farther, extirpating slowly "Union (live)" of its morphic torpor with some more and more accelerated beatings where a few shadows of jingles got also lost. Bass pulsations with an increasing pace, the minimalist rhythm of "Union (live)" is reborn of its ashes around the 12th minute by sprinkling the vestiges of its introduction between our ears. Except that here, a filet of more harmonious sequences tolls freely, whereas a soft cloud of mist is cuddling of its wide sedative hand this melody as ambient and drifting as the rhythm which seems to float between celestial bodies. 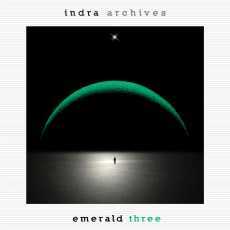 It's some very good Indra, such as we know him since his emergence in 2005. From the height of its 35 minutes, "Theta Thinking" makes us pass by all the phases of meditative music of Indra. The first 15 minutes are weaved in ambient moods with keyboard chords which scatter their dislocated harmonies in an oblivion worn out by a storm of echoing pulsations. Other electronic effects decorate this transcendental meditation while the rhythm approaches these ambiences like the continuous beatings of a big starving bumblebee. The rhythmic skeleton will not explode. It will implode with lost filets of more crystal clear sequences, adding an effect of celestial harmony to "Theta Thinking" which will always remain a big cocoon of meditation. 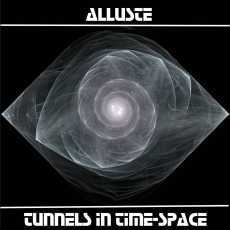 This second album of Alluste in 2016, “Tunnels in Time-Space” is in the continuity of Stars with its rhythms very in the Franke and Software styles as well as its surrounding ambiences which roam around a cosmos which seems worn out by all these sonic elements that EM has extracted from it. The Italian synthesist always exploits these slow ambiospherical introductions that he has perfumed, since Stars, of esoteric elements or seraphic moods, before exposing his delicate rhythms embroidered on movements of sequences which exploit their shadows with magnificence in constantly evolving structures. You like what you read so far? That is what is made “Tunnels in Time-Space”! This is though the way is built "Grand Father Paradox" of which the ambient rhythm, and its sequences which alternate delicately the pace, goes adrift under the soft caresses of a synth which is in a dreamy mode. The title soaks in a cosmic atmosphere with a subtle nuance in the flow that we only notice after the 2nd, and even the 3rd, listening so much the seraphic approach inundate our senses. Rapacious birds of cosmos which hoot in hollow winds, "Traveling Through Time" begins with a slender reverberating breath which spreads an ochred shade and where bursts a thick cloud of noises, as cosmic as organic. A superb movement of sequences emerges around the 3rd minute, sculpturing another structure of ambient rhythm whose delicacy is submerged by a sound fauna which renews and reveals new charms. Split into 3 phases, as mainly all the tracks here "Traveling Through Time" implodes with a clearly more lively rhythm a little after the point of the 6 minutes with sequences which catch the pace of the previous one in order to weave a more concrete but a still completely floating rhythm. It's a very good title with a quite good enriched sequencing pattern which skips and mixes its beats beneath a color of the winds of mist which offer beautiful areal zigzags. More direct in its rhythmic approach, "FTL (Faster than Light)" proposes also an ambient rhythm with a movement of sequences with keys, furtive and light, skip as snips of scissors into silk under the harmonies of a synth in TD mode of the 70's. The introduction of "Rainbow Caustic Effect" is forged in melancholy with the chords of a pensive keyboard which weakens its dreams in a storm of winds delicately watered with heterogeneous electronic effects. The movement becomes less ambient after the point of the 3 minutes, adopting even the charms of a mid-tempo which remains hung on in the approach always very nostalgic of a melody mislaid by a keyboard always darkened by layers of seraphic voices. If I have to bet on a single from this album, that would be it! The links between the 3 phases here are very subtle when "Rainbow Caustic Effect" gets loose from its embryo floating in the astral cloudiness around the 6th minute with sequences which shake the rhythm of continuous jolts as in Poland, and in effects of electronic gas, always as in Poland. This passage, quite pleasing, guides the track towards a livelier structure where the movement wears out its sequences in a long spherical dance. Harmonies of a breath of flute and the echo of knockings introduce the more minimalist structure of "Traversable Wormhole". The synth manipulates our senses with the very melodious airs of flutes while the sequences cut out with desire the primary beatings of the introduction, bringing the title towards a short phase of atmospheres where the synth divides its charms with solos and breaths of flute always into a harmonious mode. The movement takes back its beatings and their metallic shadows under a hugely wrapping of a capricious mist. The approach became minimalist, "Traversable Wormhole" reveals little by little its charms with more harmonious sequences which ring like the airs of a xylophone pursued by essences of flute. That sounds very Software, but in a more ambient approach and more smothered by an epidemic blackness. "Time Warps" concludes this last opus from Piero Monachello by always staying near the Stars zone. The rhythm is more fluid with a movement of bass sequences which takes the shape of a comings and goings on a line of rhythm decorated with other more jumpy sequences. Scents of TD, from the Tyger area, can be felt in the evasive harmonies which are in a darker envelope. Accompanied by bites of metal jingles, the synth spreads its nasal harmonies such as a forsaken saxophone which pours its plaintive harmonies in the somber alleys of time. And yes, the movement exploits its 8 minutes in order to offer its fluctuation, so much in the structure of rhythm that the harmonies, before ending “Tunnels in Time-Space” in a more floodlit approach where the rhythm, charmingly jumping, seems to cavort under a radiant sun. This is good Alluste! A little more audacious, from album to album, but always so great in its blend of Software and Tangerine Dream. Andreas Meyer is certainly one of the most beautiful discoveries among the gigantic bank of EM offered on the Bandcamp network. His music, always very romantic, is built on a delicious union between ambiences and rhythms in a sound aestheticism rich in electronic effects and in colors of tones. “Sinnenlust”, for sensory pleasures is a small bomb of sound pleasures where the German synthesist perfumes his music of esotericism and cosmic essences. We are here in the lair of the cosmic rhythms of the 70's, but with a touch of contemporaneousness in the decoration. "Garten der Lust" starts this last sonic odyssey with an abundance to colors and tones which mix the mysticism and the astral sensualism. Layers of very ethereal voices float among these lines which refine their tones with orchestral caresses. Some electronic effects decorate this garden of lechery with cracklings and songs of stellar stars while layers with lower tones lull the ambiences which are nibbled by percussions, by sighs of cymbals and by a line of sequences which jumps on the spot such as a static rodeo. What seduces is this rich pallet of electronic effects and these eternal caresses of the stellar violins that we can easily mistake with seraphic voices. Little by little, "Garten der Lust" weighs down its dimension with more effects of bass and percussions of which the illegitimate pulsations get lost in the stitches of a movement of stroboscopic sequences and in the dense musicality of those multiple synth lines, tracing a tempo which derive in the gardens of lust. We still don't know it, but we have just entered into the bewitching territories of “Sinnenlust”! Smothered pulsations and cosmic stars which crumble, the introduction all in ambiences of "Nackt durch die Nacht" goes adrift towards a dance of hundred lost steps which seek for a kind of cohesion beneath some splendid piercing songs of a synth. The percussions resound like shocks of dodgems while the sequencing pattern emerges with spasmodic lines. This fusion of sequences and percussions eventually weaved a lively and dislocated electronic rhythm which embraces a short ambiospherical phase before biting again our eardrums for another section of jerky cosmic break-dance. And always... these songs of spectres of a very acuteness synth. It's rather difficult to talk about the music of Andreas Meyer without making of link with Klaus Schulze, and "Einander Beruhren" is there to make a little reminder. The introduction and the primary phase of rhythm lights our memories of Schulze and his Body Love era. The structure becomes more contemporary with a rhythm as fluid as the flow of its jerks which pound beneath the lethal caresses of a synth and its magical solos. Let's say that it's a nice extension of "Nackt durch die Nacht" but in a rhythmic phase which goes from lento to semi-rapido still under a delicious cosmic atmosphere. "Feuer der Liebe" proposes a lively and constant rhythm with bass sequences from which the quick oscillations shake another line of sequences and spasmodic electronic percussions intimidated by the steamroller of the main oscillating line. The movement offers nuances, and in the tones and in the speed, before dying in a finale which reveals a small flaw at the level of fade-out and of the sonic bridge which ties the track with the title-track. Well, this is a little thing that annoys me! Speaking about title-track, "Sinnenlust" proposes a movement of oscillating loops which is more moderate than in the fiery "Feuer der Liebe". The rhythm is thus more ambient under a rich sound texture where crawl threatening hummings with a delicate stroboscopic effect arisen from percussions and sequences of which the crystals of prism are tinkling in a superb coat of ethereal mist. It's very romantic and especially very inspiring. "Kontakt" ends “Sinnenlust” with a very Jarre approach, so much for the entailing rhythm than the harmonious solos and the cosmic effects. What a contrasts with Irrgarten 2! Far from the minimalist structures which eventually bewitch due to deferring of the time, “Sinnenlust” brings the listener through many structures of electronic rhythms built on a skillful meshing of sequences which pound in divergent tones and of electronic percussions charmingly beaten with a well-intentioned clumsiness. The ambiences are nested in a sonic envelope of the most esthetic where all the secrets of the vintage years are revamped with a touch of modernity, in accordance with these rhythms which explain why this attachment that some thousands of aficionados have for the EM of the Berlin School style. WoW! Quite impressive this Andreas Meyer! What a pleasure I have to browse the discography of the man of 75 albums! The qualifying on Alba Ecstasy's prolificity are missing so much the synthesist and the creator of sounds and machines of sounds is even more fertile than a dozen of female cats in spring. “Behind the Horizon Line” is his how much? No idea! During some exchanges of e-mails with Mihail Adrian Simion, the count bordered 72 ones after 10 Stories. Four albums were released since. I know that it can looks as being a lack of seriousness. Except that in each album that I have listen of Alba Ecstasy I always found a kind of smile, and delight, which brushes the incredulity. If you like sequences, movements of Berlin School or still these moods papered in cosmic walls, the wide range of the Rumanian synthesist creation hides several elements which will know how to please you, even if the impression of being in a state of musical stagnation will tug you with this inescapable hunger of EM. A steady pulsation ploughs the bottom of our eardrums followed by a line of frail sequences which spills its keys in the jingles of metallic elytrons. Hoarse twists get in, bringing an organic element to this structure of hypnotic mid-tempo where a very good line of bass widens its vampiric coat of arms. Simple in its minimalist pattern, but really effective with its magnetic erosive approach, "Bouncing Rain" explains all the charms of Alba Ecstasy's music. From a simple movement pulsatoire, "Bouncing Rain" reveals its charms by grafting intriguing sound elements and by inciting subtly the pace to step up a notch to weave a delicious effect of echoing jolts. "Folded Clouds" proposes an introduction as much ambiosonic than ambiospheric with noises and sound effects which reveal a psychotronic side and a nice song of a flute of the Arabian nights. The music gets livelier with good percussions in the middle, leading the ambiences of a good heathen dance. Divided into 3 parts which reach a twentyish of minutes, the title-track begins with a synthesized wave which unties its shadows at the same time as it reveals a cardiac beating. The rhythm is slow, in spite of the pokes of percussions, and amplifies the heaviness of its pace with metallic jingles while the harmonies float as a shadow which escapes from a synth always perfumed of old Arabian treasures. 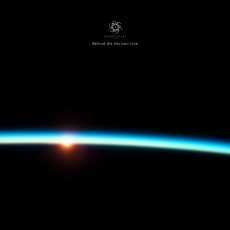 After a short and rather quiet phase, "Behind the Horizon Line (Part II)" beats more swiftly. A curt rhythm with jerky spasms in a phase of psychotronic atmospheres with a harvest of rippling lines to the colors of prism and with the sighs of its iridescent outlines. After this phase of symmetric pulsations, "Behind the Horizon Line (Part III)" attacks our ears with a series of sequences of which the keys romp around with their copies. This enticing electronic movement is knocked down by a line of bass sequences which makes its keys go off the rails and percussions which beat in an anarchy pattern. But there is a kind of unity behind this disheveled movement which feeds an up-tempo with the sound colors rather near a psychedelic and organic universe. It's some good Berlin School completely stripped of its harmonious portion. If you like the beatings, the lively and untidy sequences as well as the hits of percussions without really an harmonious rhythmic direction, this conclusion of a rather atypical title-track is made for you. "Granular Sky" pursues these fascinating rhythmic patterns of continual chassé-croisé with two lines of rhythms, a bass one and the other one crystal clear, which zigzag and crisscross beneath a sound sky ochred of noises of an organic oddity which peppers all the structures of “Behind the Horizon Line”. "Scaling in Gravity" surprises with its very Froese approach (it sounds like we are in the era of Pinnacles or Stuntman) with another lively and undisciplined movement of sequence which runs like a thousands of lost steps under the stormy shadows of a synth and its multiple lines and its breezes more in a mode of harmonious ambiences. We can even hear there a guitar spreading shyly its notes in this tumult which remains rather homogeneous in spite of the liveliness of the sequences. Boosted sequences which jump up and sparkle to the greatness of “Behind the Horizon Line” which, for an album chewed fast, charms rather easily with a good music which reaches its purpose, either seduce every fan of EM filled with sequences and with rhythms which hang onto the style of Berlin School. I liked solidly! There is always a small wind of debate when an artist revisits one of his albums. As I had never heard “Passage in Time” and further to some negative comments on this new edition, I absolutely wanted to hear the original version of this album before writing on it. It's thus a rather attentive ear and in the end delighted that I discovered and compared, thanks to the generosity of a reader, this Peter Mergener's 2nd solo album. Thematic album on the relationship of the man and his technological breakthroughs versus nature, “Passage in Time” follows the sonic horizons of Creatures with a tone and with structures which stay very near the Software universe. That should put you in appetite! "Voices of the Earth" opens this 2nd chapter of Peter Mergener in solo with effects of carillon of which the bewitchment is stopped sharp by a fall of keyboard riffs. A thick cloud of dark breezes, sound effects and orchestral arrangements follows and this can only remind us the wonderful introduction of Electronic-Universe. From then on, the parallel between the music of Mergener and the one of Software can't just be avoided. A sublime effect of voice adopts the shape of a dial of time while "Voices of the Earth" progresses of its envelope of atmospheres and of its dramatic crescendo which fades out in a dance of winds and the jingles of a huge clock. The first thing which annoys on this republication is the passage between "Voices of the Earth" and the title-track. One would say a bad MP3 with its 2 seconds gap. Thing totally absent in the first edition which therefore let's hear a little warmer, a little less colder, tone. We forget a little bit this flaw when the crystal clear keys of the sequencer are swirling with the suppleness of the glass which gets crystallize. Effects of voices wrap up this delicate opening while the hypnotic spiral of "Passage in Time" hang its charms on a line of bass which makes rise and fall its series of 12 keys. The percussions tumble down, bringing this procession of two lines of minimalist harmonies towards a rhythm finely lively (one stamp of the foot more than we dance) where 3 phases are harmonizing subtly their rhythm lines beneath the singings of a pleasantly fluty synth. We are downright in the universe of Software and this signature is all over “Passage in Time”. Decorated of the same fineries, "Mechanical World" offers a structure of more ambient rhythm, but all the same rather lively, with a synth with airs always so harmonious. The orchestral effects coat the a little wilder approach of the percussions and their metallic effects while the movement of sequences sculpts a spiral a little bit chaotic. To date I like what I hear and the game of the comparisons between the original and this edition is not really conclusive, except for this bridge between the first 2 tracks. The very military opening of "Military World" makes contrast with the relative serenity of the first 3 titles of “Passage in Time”. Set apart the effects of a military parade of 40 seconds, "Military World" offers to our ears voices perfumed of serenity and riffs of keyboard a la TD with sequenced jingles of percussions which push the rhythm towards a very ethereal movement of fluidity. 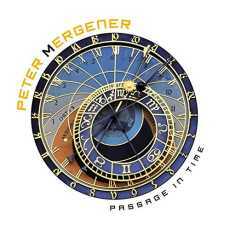 Peter Mergener exploits completely the time of each title of his 2nd solo opus by modifying the race of the rhythms with a good dose of subtlety. So "Military World" increases its pace, while remaining rather sedative, with a very TD electronic approach of the Jive years. Another nice track! Divided into 2 parts, its introduction of 4 minutes being made of atmospheres and of sound effects, "Lost Paradise" makes its series of watered sequences sparkle with a line of bass as lively as that of "Passage in Time". After the very calm and very meditative "Harmony with Nature", where the guitar of Achim Elsen is as much pensive as the one of a bluesman on a dock who hopes for the return of his lady-love, "Harmony with Nature" entails us in these phases of electronic rhythms on the verge of the Groove style such as heard on Digital Dance. Still here, the break of MP3 style between "Harmony with Nature" and "Praise" is rather irritating. Especially that "Praise" is a beautiful title which rests on an increasing structure, always fed by these twinkling sequences and by these muffled percussions, where the guitar of Achim Elsen is as good as a synth. The 2nd CD of this new edition offers more than 46 minutes of new music which was composed between “Passage in Time” period of gestation and 2014. And if we listen carefully, we can hear versions of the original album which are differently mixed. "Toni the Wind" is an apocalyptic title of atmospheres with a synth which makes bicker its breezes with different tones of which the predominance goes to airs of saxophone. After an intro loaded of ethereal ambiences, "Voyage" offers some good electronic rock with very TD percussions which mistreat a very beautiful spherical structure embroidered around these sequences so crystal clear unique to the Software universe. Moreover, the effect of having already heard this track somewhere in the discography of Software will torture your senses throughout its listening. The same goes for "Time" and its progressive growth which seems to be taken out of the sessions of “Passage in Time”. I like, even if the scent of déjà-entendu floats everywhere around "Time", "Journey" and "Timeless Memories" and its saxophone fragrances a la Toni Schneider. "Kindergarten" is another title of atmospheres, just like "Toni the Wind" and "Eternal Flow", which is very aerial, where children's clamors float on floating shadows. "Space Patrol" is the only title here which distances itself at the level of originality. Nothing of its perfumes let hear an alliance between Software and Mergener. It's a good cosmic electronic rock with a lively rhythm, even if our feet remain rooted on the ground, where our two hemispheres follow the curve of its astral dance. I quite liked it and we stay in Peter Mergener's roots with a movement in constant progression. The game of comparisons now! Let's rule at once on the quality of “Passage in Time”. It's another Peter Mergener s beautiful album who shows that he was the spirit of those rhythms in serpentines of Software. I prefer the original which is flawless at the level of the musical bridges of some structures. As for the rest, I have nothing to add except that the original version seems to have a warmer sound, a warmer soul. Also, the 2nd CD offers some good new materials, even with its airs of déjà-entendu, among which 2 solid ones in "Space Patrol" and "Time". Considering that the original version is out of stock since years, this new version of “Passage in Time” is more than agreeable. And if we are good with the art of mixing music, everything should be ok! Because this “Passage in Time” is in the continuity of the best works of Software. Just like Creatures and Take Off which will be released next year. After an introduction weaved in nebulosity, "Triangulum" goes back to the sources of progressive e-rock with a good rhythm, a quite steady one, and a flute which weaves rather harmonious beautiful airs. Sometimes heavy, sometimes lively, "Triangulum" remains anchored in its structure of progressive e-rock rather easy to consume. The flute is very beautiful and the whole thing reminds me vaguely of Mythos. We stay in the good electronic progressive rock with "Teratorn" which adopts a little the structure of "Triangulum" but with more slowness. The guitar is rather well done and the percussions are quite heavy, even suggestives. The introduction of "Cursus" is going to remind to some of you the one of The Bravery of Being out of Range from the sublime Amused to Death by Roger Waters. The structure which results from it is more in mode lento with a propensity for an electronic blues very well made. That becomes a good electronic rock spiced of a progressive touch with good riffs and good solos, as much from the guitar as the synth. The introduction hooks my feet right on the spot and the whole structure didn't has to wait that much to get my interest too. Even with a finale which is lacking of mastering. "Epitaphium" proposes a much ambiospherical introduction of five minutes with some increasing effects of synth and nice solos which coo and make twists before the rhythm follows the rules of a jerky mid-tempo where roams a line of bass and a synth of which the solos take the shape of the bass' rumba dance. It's very electronic with a scent of old vintage School. "Polychronos (Radio Mix)" ends “Polychronos” with strength. Its radio mix has nothing to do with the original structure, set apart the melody, and proposes a rhythm more in the Electronica style. More in the commercial kind. I quite enjoyed it! 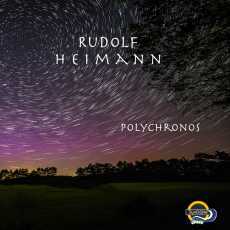 Just as I liked the whole 56 minutes of this last Rudolf Heimann's opus, even if the first listening has fed a certain reluctance, of which the biggest quality is to lug us through musical genres that we approach with a surprising ease. Because both works were closely bound, I have listened This Place to Be and “Shadow of Time” back to back for the last 2 days. And if the exercise seemed to me sometimes weighty, I saw the light there. In fact I heard the sound there. The sound of the silence! The sound of the void! Being the master in the art to modulate winds, to make sing the murmurs of the silence or to make glitter the shadows of caverns, Steve Roach re-enters the fray with another monument of dark ambient and meditative music. And as every time, the exercise implies to establish points of comparison with the ultimate masterpieces in the genre; Structures from Silence and Quiet Music. But is not exactly Structures from Silence, or still Quiet Music, what we wish. If in the past albums such as This Delicate Forever, Etheric Imprints and most recently Emotion Revealed seemed to sound a return to basics of these structures for Steve Roach, the Californian synthesist has always took a small distance to avoid the traps of the comparison. Often he has flirted with these borders. And often we had the impression that some albums supplanted the astonishing beauty of these two works. 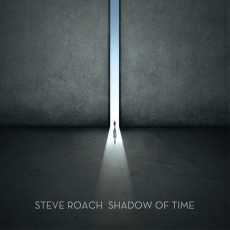 Arising as far as this time, “Shadow of Time” answers Steve Roach's need to get away from his opuses a little more dynamic. It's a pity, I liked this side of Roach! But if to do so he composes a music as so subliminal than this “Shadow of Time”, the disappointment finds a way of ecstasy there. First of all, the incomparable title-track and its 38 minutes of serenity! Easy to describe, "Shadow of Time" is a long minimalist journey where we fly on the back of a huge eagle by a dark night of heat wave. Slow winged movements spread a dark aura where each impulse collects itself such as a big wave which wraps us of its sonic froth. It's so quiet! Like these caresses which besiege us when we are between two phases of sleep. Platonic? Not at all! Each forward motion is like a tune which accentuates little by little its acuteness and changes subtly its intrusive color in the somber breaths of the drones which roam as these hoarse winds which are prisoners of the decorations of the hot Californian desert. We can hear voices here. They are as much discreet as that it could also be the fruit of our imagination which is taken by this unique sibylline stream of waves, symbolic of those drifting symphonies on silence by the only Steve Roach. If we feel the steams of This Place to Be here, it's even more obvious in "Night Ascends" whose winged movements are clearly more intriguing, more disturbing than those of the long title-track. But we always stay in the high spheres of meditative music with enigmatic harmonies blown by esoteric atmospheres. There are morsel of nightmare which are dragging around here... "Cloud of Knowing" concludes this prequel of This Place to Be with an even more quiet movement, even more immersive where the imprints of the Immersion series are roaming a little as on the lookout of our awakening. What do I find of interesting in this music which is not? A question blown by my Lise. No melody, me I found some, and no rhythms at all, still I hear the delicate ambient beat of the repetitive loops, she added. And it's all the debate! My buddy, who was my guide in the discovery of EM, found “Shadow of Time” very immersive and especially very long. So my conclusion is very personal and I think that this music of Steve Roach suits our moods. I find there what I am looking for when I need some peace of mind, when the sleep is late to chase away these dusts of hyperactivity which fight against the aphasia. And it is there that Steve Roach becomes our inmost spiritual companion. But beyond this statement, I fully agree to insert this last work on meditation from the Californian synthesist between both masterpiece aforesaid at the opening of this review and Emotion Revealed which remains for me a wonderful surprise. Created following the mega project of black and meditative atmospheres inspired by lunar eclipses Bloodmoon Rising, “This Place to Be” has landed in the interstices of the Internet in last May. The album was first offered to all for a moderate sum of you give what you want. The pressure of its success changed its face by turning for a real manufactured CD masterised by none other than Howard Givens, the man behind Spotted Peccary. And surprise! 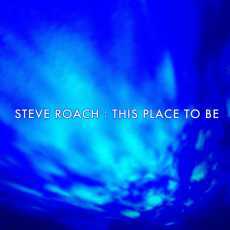 “This Place to Be” was pulled out from time in order to answer to the genesis of Shadow of Time, Steve Roach's next album which should appear on the Projekt Records label at the end of August 2016. What we have to retain from this story? That nevertheless his albums of ambient, dark and meditative music Steve Roach keeps improving the formula, keeps making the kind evolve. A distant breath of voice which is transformed into a halo of murmurs to the iridescent colors, "This Place to Be" begins its long trip of 74 minutes with a so spectral approach than cosmic. The sounds and tones which interlace together belong to both universes of which the slow impetus of gravity are cracking the untraceable breach between the afterlife and the cosmos. The hummings of drones give a viscous appearance to this sibylline envelope from where comes from all sides a thick cloud of heterogeneous noises which crash on a lantern of sounds like moths of which the agony we film in slow motion. It's very enveloping, but also very disturbing due to the intense supernatural reach. The movement bifurcates in a long cave where are whistling the walls pierced by the erosion. One would say a concert of redeeming souls in the gutter of a hell without forgiveness. Yes! Enveloping and disturbing, although some will find the doors of a new serenity there. That always depends on the ears which hear it. Me, I hear a profound sadness to cut out through the fates of the enthusiasm. And always we fall in this endless whirlwind where the blackness wraps the deficiencies of our society without rest. There where this blackness and its endless hole spits out us in order to create again the next stages of our universe. We burn ourselves there again and again? Not serious, we always have Steve Roach to help us to recovered.